Pre-Order now for delivery in Nov 2017. 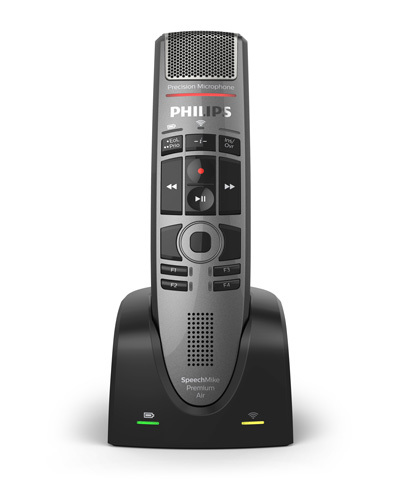 The Philips SpeechMike Premium Air is the first cordless microphone designed for professionals wanting to get the best results from their speech recognition system. Ideal for use with Dragon Medical, Dragon Legal and Dragon Professional. Includes a 2 year replacement warranty. The SpeechMike Premium has reached its highest stage of evolution. Benefit from all advantages of the industry leading dictation microphone, without the constraints of a cable. Record your voice using a premium decoupled studio-quality microphone with a built-in noise reduction filter and achieve exceptional speech recognition results. Thanks to the revolutionary lossless speech technology, the SpeechMike Premium Air offers maximum mobility without any compromises. The device achieves the same high speech recognition performance as the standard SpeechMike Premium with a cable. The brand-new device will be the first Li-ion battery operated SpeechMike Premium ever launched by Philips. As the device does not require a cable to transmit voice files to the computer, users can comfortably pace around their office whilst recording their thoughts. “The new device enables users to benefit from all the advantages of the industry leader, SpeechMike Premium, without the constraints of a cable” explains Dr Thomas Brauner, CEO of Speech Processing Solutions. The included Philips docking station provides high-speed wireless charging under three hours and instant pairing between your device and the docking station. “The charged device can easily be used for up to 23 hours. This is especially perfect for heavy users in hospitals, legal practices and other roles which carry a high administrative burden” adds Dr Brauner. With an optional foot control connected, the docking station even enables hands-free recording. SpeechMike Premium Air comes with a studio-quality microphone and a built-in tripple layer noise reduction filter for clearest recordings and most accurate speech recognition results. The powerful built-in high-speed charging Li-ion battery ensures up to 24 hours of reliable recording time. The battery can be charged easily and wirelessly in less than three hours using the included docking station.